October is National Adopt A Shelter Dog Month. The ASPCA (American Society for the Prevention of Cruelty to Animals, established in 1866) and the AHA (American Humane Association, established in 1877) have sponsored this event since 1981. The ASPCA estimates that 670,000 dogs are euthanized each year in the nation's shelters. Should you decide to adopt a dog from your local shelters, you need to do some homework. Take the time to visit each of the shelters in your area. Talk with the staff about their adoption policies and assess each shelter facility for cleanliness. By carefully choosing your dog's temporary home, you are likely to bring home a healthy, happy new family member. Let the shelter staff help find the best match for you. They can help guide you in choosing a pet that best matches your life style. Arrange a "meet and greet" with perspective pets outside of the confines of the kennel. Visit "TrainMyPet.net" for lots of great advice on working with your new family member to help him/her become settled in and adjusted to life beyond the animal shelter. Jim Tedford, President and CEO of the Association for Animal Welfare Advancement, says "A shelter is one of the few places where you can find a friend who will love you unconditionally. All you have to do is love him back!" When describing a dog, Dave Barry said, "Dogs need to sniff the ground; it's how they keep abreast of the current events. The ground is a giant dog newspaper, containing all kinds of late-breaking dog news items, which, if they are especially urgent, are often continued into the next yard." He continues to explain that "The object is not so much to walk your dog, as it is to empty him." We give you "Alarmer", who was captured in Trinidad, Cuba. Our walk down the street was announced by this scrappy little Dachshund. 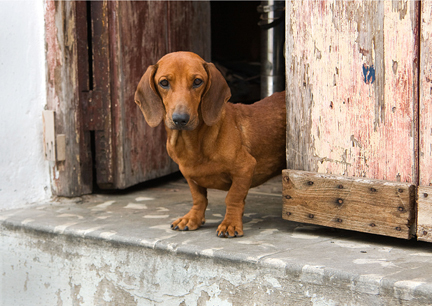 Dachshund: Heart of a lion, Brain of a fox, Body of a sausage, Bark of a Doberman! Robert Benchley said, "Dachshunds are ideal dogs for small children, as they are already stretched and pulled to such a length that the child cannot do much harm one way or the other". H. L. Mencken described them as, "Dachshund: A half-a-dog high and a dog-and-a-half long". They are described as being clever, stubborn, lively, devoted, playful and courageous. They are scent hounds, controlled by their nose and their belly! Being close to the ground, they are not keen about going for a walk in the rain. Too much splash on their bellies. A waterproof jacket made to fit a Dachshund helps overcome this problem. It is often said that potty training is ongoing for their entire life! They are loyal to their people and are very social. Their clownish antics and silly looks will melt your heart! "Teasing Terrier" was taken in a dog park in Chicago, Illinois. 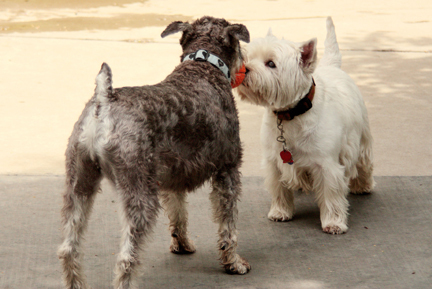 The Schnoodle, on the left, caught the red ball thrown by his master. The West Highland White Terrier, being a typical "Westie" came to investigate this red object. Westies are Scottish Terriers. They came into historical focus in the 1700's when the Malcom clan began breeding the little "earthdogs" to find and dispatch the rats that were pillaging the grain stores and spreading disease. They are described by the AKC (American Kennel Club) as being "possessed with no small amount of self-esteem". They are sturdy, spunky and bold. They will pursue with tenacity anything that moves. Assertive but cheerful, they may become demanding and testy when they don't get their way. They are determined diggers and barkers. The Schnoodle, developed in the 1980's as a low-shedding, low-dander family dog, is a "designer" dog, a cross between a Poodle and a Schnauzer. They are companion dogs and need to live in a house, never outdoors. Opening your heart and home to a crossbreed is like opening a beautifully wrapped package on your birthday: you never know what's going to be inside. It's often assumed that a crossbreed will combine the best of two or more breeds, but genetics don't always work that way. The way genes combine and express themselves is not always subject to a breeder's control, even less so when two different breeds are crossed. A cross between a Miniature Schnauzer and a Miniature Poodle can be a charmer. It combines their intelligence with the boldness of the Schnauzer and friendliness and vanity of the Poodle. Generally, they are said to be excellent watchdogs, clever, devoted, obedient, intelligent, strong-willed, protective, funny and loving with a life span of 13 to 17 years. If you get to thinking you're a person of some influence, try ordering somebody else's dog around!